Many businesses and individuals may not recognise the importance of choosing the best web host. Choosing the right host is essential if you want your blog, website, or online business to survive and more importantly, succeed. Following a lot of positive response regarding our last comparison between SiteGround vs BlueHost, we have decided to compare even more hosts. Having setup test websites on all of our top 10 web hosts, we can provide you with accurate data and an honest comparison. Many web hosts set out with a mission to provide the best customer support. Unfortunately, not all of them make the grade. Customer support is not just about responding quickly, or having multiple forms of contact (though that helps). It also comes down to the actual technical knowledge a web host’s support staff can provide. Both SiteGround and HostGator have similar forms of support. Both offer a live chat service, support ticket system, and telephone contact. We took it upon ourselves to test each of these services to see how good they really were. In our experience, SiteGround have always been easy to contact, and a pleasure to speak with. One of my favourite things about SiteGround’s support is that they actually outline how long each support method may take. This is an excellent example of a small feature making a huge difference. For users who have a time critical issue, they can speak to someone straight away. For those that may have a more detailed issue that doesn’t need an urgent response, they can log a support ticket. Once logged into your account, if you want to contact support, SiteGround provide you with their recommended support method. This appears to be based on response time, and is measured in real-time. Our experience with SiteGround’s live chat service has always been exceptional. Within a matter of minutes I’ve been able to connect with an advisor and have my questions answered. Today I logged into my account in order to transfer a website from another web host to see how easy it would be. Things couldn’t have been simpler. SiteGround’s website transfer process is not only free, it’s super user friendly, even for beginners! HostGator were initially a bit of a concern for me. Why? Because they’re based in the U.S.A., I naturally assumed that their support may not be as good for U.K. customers. However, their support channels did seem very similar to those of SiteGround. 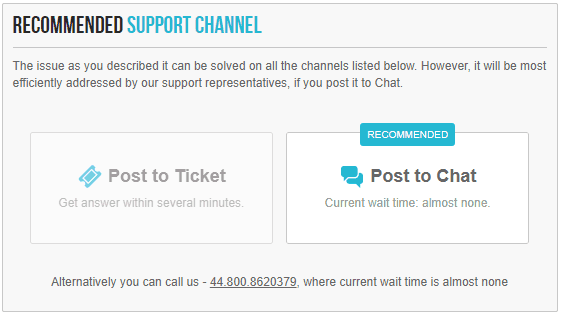 Unlike SiteGround, HostGator don’t have any information about how long it might take to connect through their support channels. We took a look at HostGator’s most recent Twitter mentions to see if we could find out more. 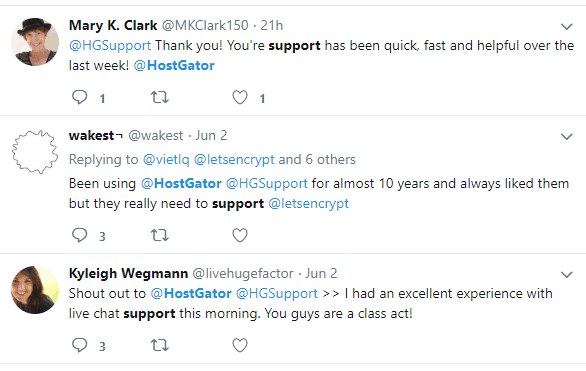 It would seem that HostGator and it’s support channels are popular with their users! All that was left for us to do was to contact their live chat support to see if we would encounter a positive experience. 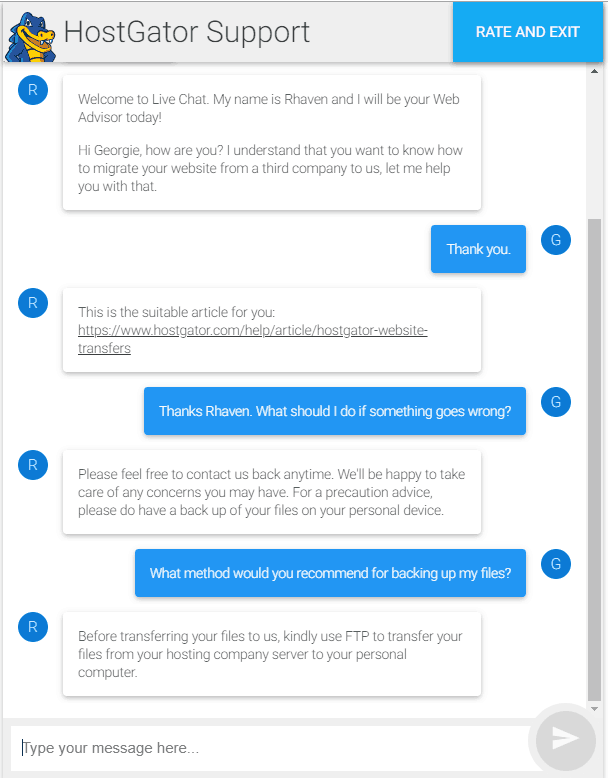 We logged into our test website account and initiated a live chat support regarding a website transfer. Our chat advisor, Rhaven, was very helpful and knowledgeable. 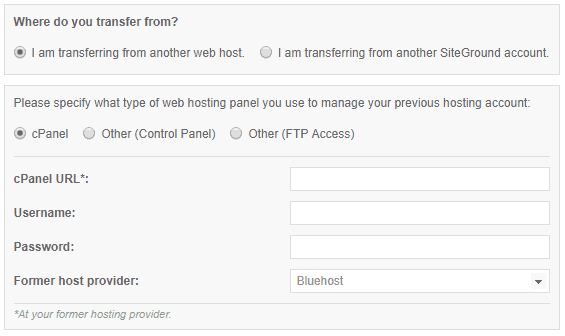 He provided a useful article on how to transfer a website from another host. He was also able to answer our question regarding the best method for backing up our files. And the winner is… SiteGround! Both web hosts in our comparison boast a 99.9% uptime guarantee. 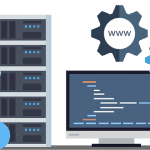 Although uptime is very important, it’s not the only factor to consider when choosing the best web host. It’s essential to bare in mind server response time, page speed, and server performance. In order to gain an accurate representation of what each host could offer, we signed up to both web hosts using their shared hosting. We created test websites so that we could monitor each site’s performance using Uptime Robot. One thing that really sets SiteGround apart from other web hosts is it’s ability to keep their customers updated. SiteGround seem to go the extra mile to make a huge difference. For instance, yes they guarantee a 99.99% uptime, but they also publish their results. They don’t shy away from publicity and don’t attempt to hide their statistics. What’s more, they say that if you experience more than 0.1% downtime over a yearly period, you’ll be compensated for it. We’ve been monitoring our website’s uptime with our site that’s hosted by SiteGround. 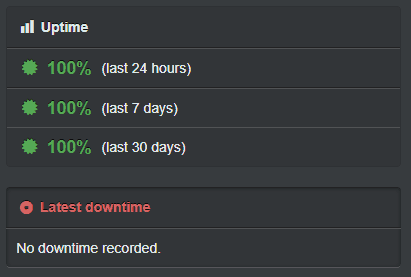 Over the last 24 hours we’ve received a 100% uptime status, 99.99% in the last 7 days, and 99.99% in the last 30 days. SiteGround certainly kept to their guarantee in our case! 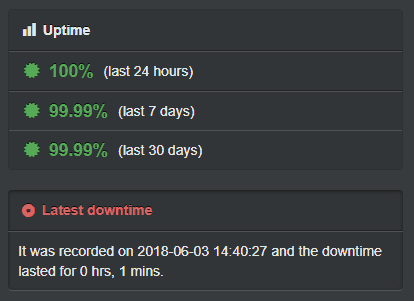 Uptime Robot reported a 1 minute downtime due to a bad gateway (502) error. According to our research, this error can occur for many reasons and may not always be down to the server host. Pleased with our uptime results, we took a look at our website’s response time. Bare in mind that our WordPress website is not optimised at all. It is based on the Twenty Seventeen theme and includes no plugins or cache. Our average response time over the past 24 hours with SiteGround was 752ms. It is recommended that websites have a response time of less than 200ms, according to Google. However, to reiterate, this is a vanilla install of WordPress with no plugins. HostGator provides several guarantees, including 24/7/365 support, 45-day money-back, and a 99.9% uptime. It doesn’t appear that HostGator publish their uptime results, so we monitored our website hosted with them to see for ourselves. Using the same monitoring method as we did with SiteGround, we used Uptime Robot to check our HostGator’s performance. We were very pleased to experience a 100% uptime result over a 24 hour, 7 day, and 30 day period. To keep our comparison fair, we also checked out HostGator’s response time. This gives us an idea as to how long it takes for a user to visit our test website, and for the server to respond. Our website with HostGator was installed via WordPress and contains no optimisation or plugins. HostGator’s response time was 776ms, very slightly slower than our website with SiteGround. 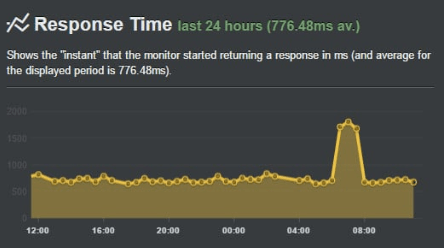 Although both hosts were similar in this aspect, we did notice HostGator’s server response time peaked to nearly 2000ms over a 2 hour period. And the winner is… SiteGround and HostGator! Price can be a bit of a touchy subject when it comes to web hosting. I agree, cheap is good, but it shouldn’t be the underlining reason you choose a web host. So, why do we have a section on pricing then? We looked at both web hosts shared web hosting plans. We took into account their prices, as well as the features they offer. Essentially, what you can get for your money! We won’t go into too much detail about features though, that’s for the next section. SiteGround’s shared hosting plans cover pretty much everything. From their basic StartUp plan for blogs and personal websites, to their GoGeek plan for the bigger players. Starting at only £2.75 per month, we took a look at what each plan had to offer. Admittedly all of the above may not be useful for every user. However, we were really impressed with SiteGround’s features that come as standard. We’d be happy just to receive CloudFlare CDN! When most people compare SiteGround’s hosting plans, they pick up on the 10GB web space in the StartUp plan. Why? Because 10GB doesn’t sound like much, but it’s actually plenty for the average website. Most webpages don’t exceed 3MB! Along with a 99.9% uptime guarantee, you’ll also enjoy a fast setup experience, website creation, and a free website transfer. If you don’t believe us, try it out for yourself by using SiteGround’s free cPanel demo. Like most web hosts, HostGator also offer 3 shared hosting plans. 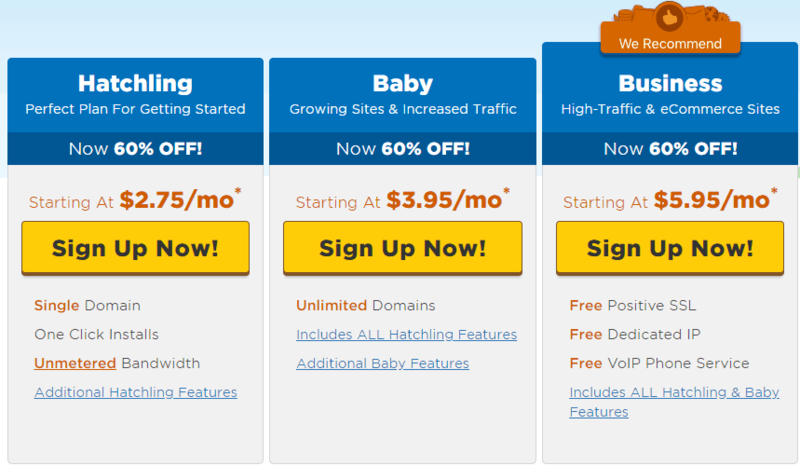 Starting from only £2 per month, you can get your hands on HostGator’s Hatchling plan. If you’re willing to spend just a little more, you’ll be able to upgrade to their Baby plan, or their Business plan. HostGator’s plans don’t give away too much at first sight, but delving into their plans a little deeper shows us a lot more. All of their shared hosting plans include unlimited disk space, unmetered bandwidth, and instant backups. They also come with $100 free Google AdWords and Bing credit. Unlike SiteGround, unfortunately you won’t be able to get a free SSL with HostGator unless you take their Business plan. But you will be able to use the latest cPanel with all of it’s standard features. In addition to the above, HostGator will give you access to AWStats, and all of your favourite 1-click installs like WordPress and ZenCart. Unfortunately we weren’t able to determine whether HostGator offer SSD or HDD storage, so we will assume HDD. We caught a glimpse of what each web host had to offer by looking at their pricing plans. However, it’s a bit difficult to base our opinion on the basic features without either using them, or finding more. As both web hosts use cPanel, we logged into our test website accounts to see if we could locate any differences. We also experimented with some of SiteGround and HostGator’s more advanced features to compare what they had to offer. As well as a large focus on their customer support, SiteGround pride themselves on using the latest technologies. Surprisingly, not every web host offers SSD storage. SiteGround do, for free, on every shared and cloud plans. SiteGround use NGINX web server technology. This simply means that the static content on your website will load much faster. Alongside this, SiteGround’s SuperCacher means your WordPress, Joomla, or Drupal website can experience increased speeds through expert optimisation. Another useful feature is SiteGround’s data centers, which have 4 different location options. 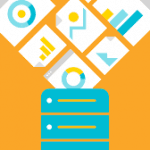 Choosing the data center that’s closest to your customers or visitors is essential for a good user experience. You can choose from U.K., Amsterdam, Singapore, or U.S.A., all completely free of charge. HostGator don’t appear to be too far behind SiteGround when it comes to their features. Like many web hosts, HostGator provide their own free website builder as part of their share hosting packages. 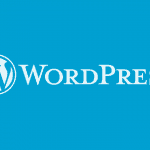 You won’t necessarily have access to as many features as WordPress, or similar CMS platforms. But with HostGator’s website builder, you’ll have lots of themes to choose from as well as pre-built sections on pages to help you get started. An ever increasingly popular feature is HostGator’s free $100 marketing credits. For use on new Google AdWords and Bing accounts, you can get your marketing journey off to a flying start. It would be rude not to accept! HostGator’s cPanel gives you access to all the latest applications. I know personally I’d be lost without access to WordPress, Joomla, Drupal, etc. Thankfully it’s now more common than not for web hosts to include these popular 1-click installs. There’s no doubt that both SiteGround and HostGator are great contenders. Both hosts often come up on the top web hosting lists around the world, and for good reason. Personal opinion does play a role when it comes to choosing a web host. We based our comparison on the purchase of each host’s basic shared plans. Whereas some of you may focus more on blogs, and others on eCommerce sites. If you’re hoping to keep your web hosting fairly basic and cheap, HostGator is a brilliant option. Their customer service was efficient, friendly, and helpful. Their uptime shone through with a 100% result, providing a great all-round performance on our test website. However, if you’re willing to pay the difference of a cup of coffee, SiteGround will offer you a lot more for your money. Their free features blow most other hosts out of the water, including free SSD storage, SSL, site transfers, and more. They’ve really taken the time to focus on excellent technologies that make a difference. As you probably all ready know, SiteGround for me in hands down the best hosting company that I’ve tested and come across. I use them for all my sites, need I say more?